Nairobi — A new audit report shows that Nairobi County Government losses millions of shillings in the parking department due to weak enforcement by County officers. Parking being one of the major streams which the County relies on to raise revenue, has however not been optimized denying the City the much needed revenue. According to Auditor General Edward Ouko's 2016/2017 report, the number of vehicles that did not pay the required parking fees represented 69 per cent of vehicles parked that period indicating a high level of non-compliance. "Out of 1,305,440 vehicles parked, 402,401 (31%) were compliant while the reminder 903,039 (69%) were not compliant resulting to a probable revenue loss of Ksh 270, 911, 700," reads the report. This is based on street parking fees of Sh300. The report faulted the County government for not putting adequate measures to deal with non-compliance despite having real time updates of vehicles parked in the City relayed by the automated revenue collection system JamboPay. The report further pointed out that City officials were unclamping vehicles without payment leading to loss of revenue. Based on the year under review, 25,700 vehicles were clamped as per system records. "Unaccounted clamps totaled to 15,388 representing 60 per cent of the total clamped vehicles, meaning the county lost revenue equivalent to the unauthorized releases," reads the report. The County charges Sh2,000 to unclamp a vehicle. Implying that City Hall lost approximately Sh 30 million under the year. 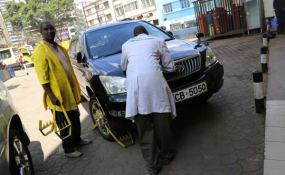 The County Government has been accused of failing to put in place adequate measures to curb non-compliance as there is no system for monitoring the activities of field officers on the clamped vehicles to ensure that those unclamped have paid. In the same year, revenue is also reported to have been lost in off-street parking due to system downtime. Despite automation of off-street parking which include Law Courts, Sunken, Nginda and Intercontinental parking areas, the automated system was noted to be down significantly long durations necessitating use of manual ticketing which is prone to manipulation. "The four parking areas indicated annual revenue of Sh20,820,720 versus estimated revenue capacity based on the available number of parking slots of Sh33,678,000 resulting to a variance of Sh 12,857,290. The variance has not been explained," reads the report.